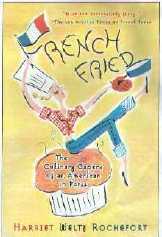 Harriet Welty Rochefort's book on food "French Fried: The Culinary Capers of an American in Paris"
French Fried : The Culinary Capers of an American in Paris, is the story of one American woman's foray into the fascinating, complex and often byzantine world of French cuisine. And when it comes to cuisine, Harriet's experiences are anything but dull or traditional. When she first arrived in France, she dined on onion soup with her concierge. When she finally got a decent apartment with a kitchen (in which she did not cook), it turned out that there was both a shower - and a cop - in it. When she married Frenchman Philippe, the jig was up. Cooking, she realized, would now be part of her life whether she liked it or not. Digging in her heels, she graduated from opening cans of peas to casually knocking out two major three-course meals a day (about 21,000 meals, her French husband calculates) in no time at all. Not only that, but she prepares and eats rabbits, tripe and blood sausage with gusto. In her book, she gives a picture of how different life and eating in France really is. Globalization and standardization may menace the Gallic cuisine but not for how long if Harriet is around to defend it! Read the pages of this site : recipes and tips on food ! "One night in our country place we were invited to the home of friends. All of us, including the host and hostess, were dressed casually in our country clothes and it might have been a simple country meal which would have been fine. It turned out, though, that our hostess had gone to a lot of trouble for us. Her entrée, in particular, was stunning: beautifully presented baked oysters on the half shell in a delicate sauce. A tiny dark green spinach leaf adorned each oyster shell. Then we had succulent coq au vin, chicken in wine sauce, and potatoes, the cheese plate, and a homemade baba au rhum, a sponge caked soaked in rum. I know that the oysters alone must have taken her hours! But we had been invited three weeks ahead of the date so she had plenty of time to think about and devise her menu strategy. One reaction to this could be: why go to so much trouble? Having lived in France so long, I've come to understand "where she's coming from" in the sense that if you invite people, you want to make it a very special occasion for everyone, one they will remember with pleasure." For upcoming speaking engagements, see her site.
" One culinary disaster, which wouldn't happen today, occurred when I decided, in 1976 (pre-hamburger days in France), to have a casual American party at which the guests would assemble their own hamburgers. First of all, I had to explain to the baker what a bun was. He made them especially for me and they were much better than any bun I have ever had before or since. Then I had to explain to my French guests (I reiterate: this was pre-McDonalds and the invasion of American food) that since the buns were there and the meat was cooked, all they had to do was put the two together and add catsup, mustard, pickles or whatever they wanted. They had never done this before and must have thought it was totally crazy. But being extremely polite, they executed, and stood around awkwardly nibbling on their hamburgers which they seemed to like in spite of having to hold them in their hands, constantly watching to make sure catsup didn't ooze out of them. Even more than the oddness of the hamburger, the idea of inviting people over only to make them stand in an assembly line to construct their own dinner must have seemed strange to them because in France when you invite, the idea is to spare you guests any work! So much for being that casual!" French Fried was published by St. Martin's Press in February 2001 and is available for sale at all major bookstores in the U.S. and in Paris and on amazon.com, barnesandnoble.com and borders.com. January 2002 : French Fried was translated and published in Chinese ! See my Chinese page. Letters from readers About the author ! A review on Amazon.com by a reader from Denver, CO. USA "Rochefort's follow-up to "French Toast" focuses on the culinary differences between America and France, which have led to huge differences in culture, lifestyle, and waistlines. With a breezy style and self-deprecating wit, she demystifies what the French cook, how they cook it, how they eat it, and how it enhances the pleasures of life. Surely one of the pleasures in life is relaxing with this book and a nice glass of red wine. It's been an interesting experience to read this book (a celebration of good food, good wine, and a high quality of life) alongside Eric Schlosser's "Fast Food Nation" (a wonderfully written and thoroughly depressing exploration of the rise of fast food in the U.S. during the latter half of the 20th century and its impact on our culture). Rochefort, too, warns of the encroachment of McDonalds and other American fast-food enterprises on the French culinary landscape; she notes that she hopes her observations of French cuisine will not serve as a memorial of such an inherent part of French culture. Reading these two books side-by-side guarantees that you will never eat fast food again. And to make certain of that, Rochefort includes several tried-and-true French recipes. The ones I've tried have been simple and delicious!" Harriet Welty Rochefort grew up in Shenandoah, Iowa and studied in the Midwest where she earned her B.A. at the University of Michigan and her M.S.J. at the Medill School of Journalism at Northwestern University. A lifelong attraction to France led her to visit Paris during college and in 1971, she hopped on a freighter to Cadiz and ended up in France once again - this time to stay. As a freelance journalist in Paris for the last twenty-five years, she has contributed articles on French business, lifestyle, travel and culture to many major U.S. newspapers and magazines including Newsweek,, The International Herald Tribune, The Atlanta Journal and Constitution, European Travel and Life, France Discovery Guide, and Time Magazine, where she worked as a part-time reporter in the Paris bureau for almost a decade. In addition to writing, she taught journalism seminars at the Institut d'Etudes Politiques in Paris from 1992-1997 and since 2006.In addition to French Fried, Harriet Welty Rochefort wrote a book on the French : visit the page on French Toast: The Maddening Mysteries of the French. Harriet's first book, French Toast was published by St.Martin's Press in 1999 ; to date, it has sold more than 80,000 copies. Do the French deserve their reputation : charm, good food, enjoying their life ? In her book, published in Fall 2012, Harriet Welty Rochefort explains how to wine, dine and romance like the French, and much more. Click here to know more and keep posted! Thank you for writing to her ! SCOOP! After three non-fiction books about France and the French, Harriet Welty Rochefort decided to writer a historical novel about life in France during one of the most tragic periods of French history : the Nazi occupation of the country. Click here to know more and keep posted! To pages on other books by Harriet Welty Rochefort : "French Toast", "Joie de Vivre" and "French Toast (in French)"